Integrity, sincerity, and excellent customer service, pretty much sums up this first class company! I can't say enough positive things about this jumping house party rental. 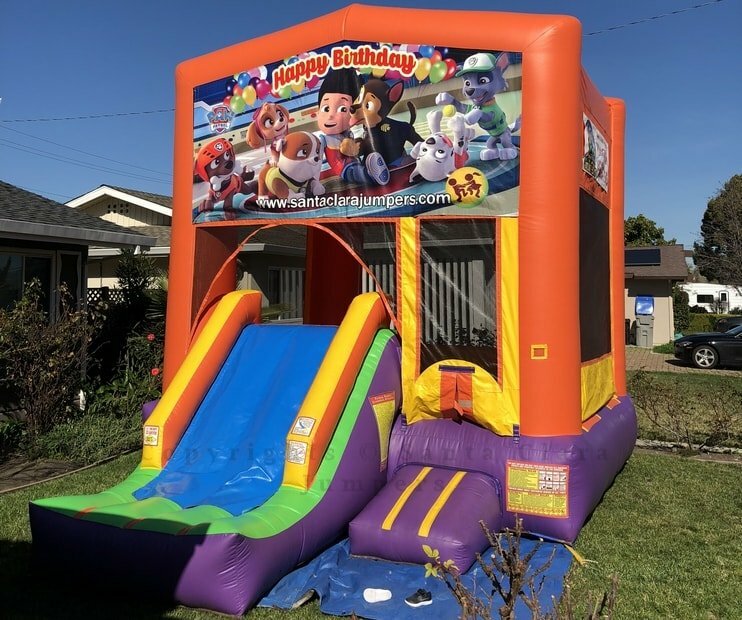 We booked Tables, chairs a happy birthday bounce house combo slide and a cotton candy machine for our son's 5th birthday. This was my first time renting a bounce house and Tom was very patient and so helpful on the phone. They arrived within the time frame, and set up quickly. I couldn't be happier with our experience. We will definitely use Santa Clara Jumpers for all our future party rentals. I've already been singing their praises to all my other mommy friends. Keep it up. We are so satisfied with this company, they provide the best customer service. I've rented from Santa Clara Jumpers twice now and had great experiences both times. The Bounce Houses and tents were very clean (Almost like new) and get set up and picked up on time and quickly by friendly people. Great price and and excellent service. Will be using them next year for all of our jumper needs! We've worked along side of Santa Clara Jumpers for sometime now and have even used them for our daughter's birthday parties. I was first turned on to Santa Clara Jumpers by our customers who had only great things to say. I've been in the event services industry for over 17 years and have seen first hand hosts who are stressed out or in a rage because their party is an hour or 2 in and the jumper that was supposed to be delivered that morning still wasn't there! After hearing so many good things from our customers we decided to book Santa Clara Jumpers for both of my daughters birthdays and my experience with them was phenomenal. They were extremely accommodating and professional throughout the booking process and were prompt and punctual on the day of the event. Since then they have been our go to and also the our favorite referral! Santa Clara Jumpers and Tom deserve 10 stars. So pleasant and easy to work with. I decided last minute to get a bounce house for my daughters birthday and Tom made it so easy. I texted him the info and he was there the next day as planned with a castle bounce house that was like new! Tom set it up in the safest and best location, cleaned it inside and out and then came back after dark to take it down. One of the easiest experiences I've ever had. Will definitely be using Santa Clara Jumpers again and highly recommend them. Called 2 days ago trying to get a bounce house for Easter party for my son and his friends. Didn't get through and we left a voice message. They called back in about an hour. Told them what we were looking for and scheduled the time for setup without any problem. They got here right on time this morning to setup the bounce house in my back yard (on the grass). It was very clean and they sanitize it after setup. After the party, they were on time for retrieve the bounce house in the evening and clean up any debris. Very satisfying hassle-free service. I had a very good experience with Santa Clara Jumpers. I called 2 days before the event. The person I spoke to on the phone was very pleasant and patient, and they had the jumper I wanted. I received an email confirmation the next day. On the day of the event, they arrived on time, helped find the best spot to install it, and the jumper was spotless - like new. Pick up was on time, and since the kids were still jumping, the gentleman waited a couple of minutes for the last party goers to leave. I will definitely use this company again!